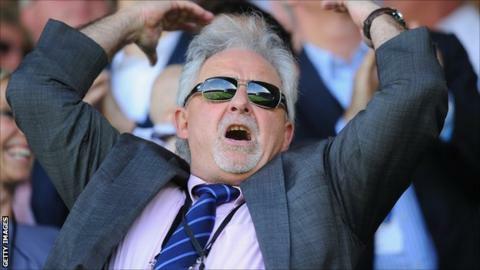 Portsmouth chairman Iain McInnes says the decision to part company with manager Andy Awford was the hardest of his two-year reign at Fratton Park. "It's been a bad day," McInnes told BBC Radio Solent. "An awful day". "Today is about Andy and how he handled himself in the most incredible fashion when we met and had a conversation." After the internal appointments of Guy Whittingham and Awford, McInnes says the club will now look externally for a replacement. "Some will feel Andy has not moved the club on, some will feel he should have been given more time. The club has stalled this year, the budget is good and they've underachieved. They are better than the situation they are in, they should be in the play-offs. It's the most wonderful job in the world, they are the most magnificent supporters. I'd do it in a heartbeat - that is well known - it's something I've always wanted to do. I wish I could get it out of my system." And McInnes has left the door open for Awford to return to the club in the future in an alternative role. "We need to make a clean break and that is Andy no longer being manager," he said. "Andy has expressed a wish to be considered for another role at this football club some time in the future and we will have conversations to that end at some stage. "At the end of the day we have to get the right manager for this football club. "I think we need to be looking at someone who has experience at this level and someone who has been successful at this level. I think probably part of the requirement will be that he has had no previous connection to the club." In between the appointments of Whittingham and Awford there was Richie Barker and McInnes said he takes no pleasure from the constant changing at the helm. "I detest the fact this is our third managerial change," he added. "The play-offs were the minimum requirement for Portsmouth this season and, barring a good first month of the season, the team haven't looked like featuring in the promotion race. Awford was almost sacked at the end of January, only to then go on and win the League Two Manager of the Month award for February. However, things have fallen away badly in recent weeks, with the club in danger of their lowest-ever Football League finish." "We all know stability is key for any successful football club and off the pitch we are achieving it and on the pitch we are not. We have to look at ourselves and decide how we change the process so we get it right next time around. "Portsmouth football club is always going to be an attractive proposition for a level of manager. I have to be honest, because we are in League Two, some of the managers we would aspire to try and attract and who the fans would love to see, won't risk their CVs at this level."